Delhi-based Bargain Technologies Pvt Ltd, the company behind Vantage Circle, a platform that connects brands with employees of corporates, has raised Rs 1.2 crore (just under $200,000) from a group of six investors, led by Raghu Bathina of Hyderabad Angels. The company will use the capital to ramp up its sales activities and also to launch more products. Vantage Circle was founded in 2011 by Partha Neog (CEO), KC Ramakrishna (COO) and Anjan Pathak (CTO). A MBA from Indian School of Business (Hyderabad), Neog was earlier product head at 99acres.com. In the past, he had also worked at Hughes in India, the US and the UK. Ramakrishna is a B Tech from NIT Kurukshetra, and had earlier worked at Infosys and Conexant. Their partner Pathak had previously worked at Tesco, Thomas Cook and Phillips. 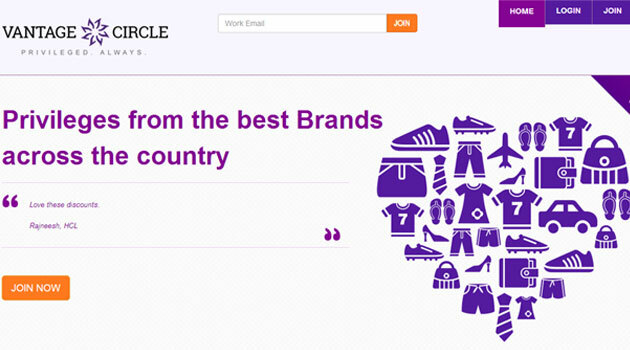 Vantage Circle is an online corporate employee privilege platform, which brings together brands and corporate employees onto a single platform. Users can engage with various brands through different mediums like exclusive deals, mailers, contests, surveys, polls etc. on the platform. The company claims that the platform has a user-base of 300,000-plus employees from some of the top corporates in India like HCL, Infosys, WIPRO, Aricent, GE, Mu Sigma, Capgemini, Ericsson, Bausch & Lomb and Encore. "On this platform we have a range of exclusive privileges across varied categories and segments, offered to employees. Be it dining, holidays, hospitals, utilities or insurance, we currently provide 400-plus handpicked privileges which are specially personalised and customised as per employee demographics, usage and preferences," said Neog. Currently, the company is working with more than 200 brands such as Samsung, Tata Motors, redBus.in, cleartrip.com, Tata Sky, Carat Lane, Toyota, Croma, Mahindra First Choice, Futurebazaar.com, Apollo Pharmacy, etc and more than 190 vendors across India.